Our Pick 'n' Pluck Foam set can fit your equipment in your carry case securely. 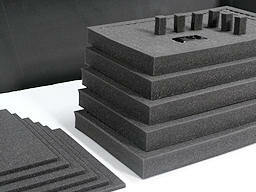 These multi-layer polyurethane foam sets are engineered to make it easy. The upper foam layer for the lid and thinner bottom piece provide a protective base and cushion for vertical movement. The pre-cut grid area in the middle layer(s) allows you to quickly customize the arrangement of your equipment. Simply lay out your equipment with adequate space between each item, and remove the foam to create a snug and protective opening for each item. Our most commonly used foam is a high load bearing open cell polyether; this is especially effective as packaging foam for custom case interiors. 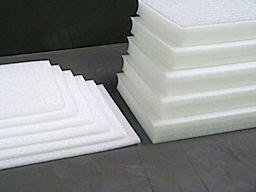 This type of foam can also be used for standard foam lining. Each pack contains 5 pieces of Pick 'n' Pluck Foam size 560 x 350 x 50mm (22" x 13.8" x 2") and 6 pieces of lining foam size 560 x 350 x 12mm (22" x 13.8" x 1/2"). Each side of the removable squares in the grid is 25mm (1"). Pick 'n' Pluck Foam can be easily cut to size to match the size of your case. Same as the above but half the thickness. 5 pieces of Pick 'n' Pluck Foam 560 x 350 x 25mm (22" x 13.8" x 1") and 6 pieces of lining foam size 560 x 350 x 12mm (22" x 13.8" x 1/2"). Each side of the removable squares in the grid is 25mm (1"). Same as the above but just 1 piece of Pick 'n' Pluck Foam and 1 piece of lining foam, 50mm thick. Same as the above but half the thickness, 25mm pick 'n' pluck. Same as the above packaging foams, but made from white Ethafoam which is much firmer, ideal for heavier equipment. Ethafoam provides excellent cushioned protection against persistent shocks. It's the preferred foam for protecting heavier items. Each pack contains 5 pieces of Ethafoam Pick 'n' Pluck Foam size 560 x 350 x 50mm (22" x 13.8" x 2") and 6 pieces of lining foam size 560 x 350 x 12mm (22" x 13.8" x 1/2"). Each side of the removable squares in the grid is 25mm (1"). For larger items just put 2 or move pieces of Pick 'n' Pluck foam together, by using our spray adhesive. Same as the above but half the thickness. Each pack contains 5 pieces of Ethafoam Pick 'n' Pluck Foam size 560 x 350 x 25mm (22" x 13.8" x 1") and 6 pieces of Ethafoam lining size 560 x 350 x 12mm (22" x 13.8" x 1/2"). Each side of the removable squares in the grid is 25mm (1"). Pick 'n' Pluck Foam can be easily cut to size to match the size of your case. Same as the above but just 1 piece of Pick 'n' Pluck Ethafoam and 1 piece of lining foam, 50mm thick. Arrange all of your equipment on top of the pre-cut grid. Leave adequate space between each item of equipment. When satisfied with the layout, begin to trace around the items with a sharpened piece of chalk. Toothpicks may also be used to mark the perimeter of the foam to be removed. CAREFULLY AND SLOWLY remove whole plug in one piece. Insert equipment into their cutouts. Notice how the items fit, you want a snug fit but not to the point that the foam gets compressed. If you find you have made a mistake or have any loose areas, put back one or more of the previously removed plugs and secure them with our spray contact adhesive, which can be purchased here.